Monadnock Cooling Systems firmly believes that proper and thorough maintenance on HVAC and Refrigeration systems is absolutely essential. Bi-annual system maintenance helps to maintain system efficiency and extend the life of your system. 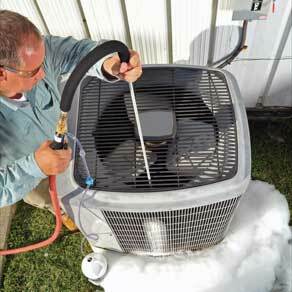 Regular HVAC maintenance will keep the operating cost of the system at its lowest, based on load. A regular maintenance schedule will also help keep your system breakdowns at a minimum. Monadnock Cooling Systems follows the ACCA/ANSI guidelines for commercialRefrigeration & HVAC maintenance. This not only covers cleaning the indoor and outdoor coils, but inspection and changing of the air filters and belts. Electrical inspections and motor amp draws are done, as well as motor and blower bearing inspections. After all the inspections and cleaning have been done, a system operation test is then performed to see what the refrigerant pressures are now operating at. These tests may also foretell any arising system problems. Call our sales office today at 603-924-2513 for a quote on a customized commercial HVAC maintenance program for your facility. Commercial HVAC service repairs will be needed on most systems from time to time. As heating and cooling units age, components wear out and either fail or cease to perform efficiently. All issues found during our preventative maintenance inspections are noted and discussed with the client. Our Service Team is trained and certified to accurately diagnose and repair the vast majority of commercial HVAC / refrigeration systems utilized by our local clientele. Any necessary repairs will be scheduled so the “down” time of the system is at a minimum. Emergency repair service is also available for our clients 24/7 — every day of the year! Monadnock Cooling can help with all your commercial or industrial HVAC maintenance needs!